Half of North Americans use a drink linked to dementia on any given day. Categories: artificial sweeteners, soft drinks, sugar | Tags: artificial sweeteners, brain, dementia, pop, soda, soft drinks, sugar | Permalink. The Stevia plant with its ‘sweet leaf’ is a sugar substitute and also incredibly good for you. Unlike sugar, it doesn’t create an insulin response and actually nourishes the pancreas, which helps regulate blood sugar. The leaf is 30 times sweeter than sugar, while extracts are 300-400 times sweeter. This is good for the sugar addict as it will give sweetness without all the negative effects of sugar. Type 2 diabetic patients who took 1 gram of stevioside (present in the plant Stevia) with a meal had an 18 percent reduction in blood sugar according to this study. A study that compared Stevia, regular sugar and aspartame, showed that Stevia lowered blood sugar and insulin levels after a meal. Note: Artificial sweeteners often raise your blood sugar levels even more than sugar. Stevia has sterols and antioxidant compounds (kaempferol, quercetin, chlorogenic acid, caffeic acid, isoquercitrin and isosteviol) in it and studies have found that kaempferol can reduce the risk of pancreatic cancer by 23 percent. A study in 2009 found stevia helps lower bad cholesterol and increase good cholesterol. Research also noted that the subjects had no adverse side effects from the Stevia on their health. This 2012 study found that stevioside helped to decrease specific stress pathways that create breast cancer growth. Stevia has no calories or carbohydrates. Consuming added sugars has been shown to contribute an average of 16 percent of the total calories in the American diet. This high sugar intake has been linked to weight gain and adverse effects on blood sugar. Fights Cavities: The ‘sweet herb’ is antibacterial, and unlike sugar, it does not feed oral bacteria and is recommended by the National Center for Biotechnology Information to be helpful in preventing cavities. Stevia extracts were linked to less acidic plaque, which is good for cavity prevention. Skin Care: The antibacterial properties help with acne. I have experienced a pimple disappearing soon after using stevia on it. Fights Yeast Infections: Stevia does not feed candida or other yeast and is slightly antibacterial and anti-fungal. Can One Be Allergic to Stevia? The European Food Safety Committee after reviewing the Stevia literature stated that there was no cause for concern for allergic reactions to the Stevia plant. Also, the FDA declared that stevia was safe in foods and beverages. Some Stevia extracts are so isolated that they have a bitter taste and so other artificial sweeteners have to be added. Some commercial Stevias have been extracted solely with alcohol solvents (usually the white powder form). This alcohol solvent leaves the sweet taste of the Stevia but can take away some of the health benefits. Highly processed “Stevia,” such as Truvia, is not real Stevia by the time it goes through refining. Chemical solvents are added during the refining process which includes acetonitrile, found to be toxic to the liver and a carcinogen. Categories: stevia | Tags: artificial sweeteners, diabetes, stevia | Permalink. A lifelong friend of mine suffered from debilitating anxiety for years. It was hard to watch her have panic attacks, knowing that people did not understand her behavior. Although anxiety disorders are the most common mental health illness in the United States, only about one-third of affected individuals receive some form of treatment. From a young age, I read books every chance I got. Taking a particular interest in the human brain, it was only natural that I would go on to study psychology and neuroscience at a university. Focusing on both mental health and nutrition, I quickly realized how one’s diet influenced brain health and overall well-being — my attention shifted and this connection has been the focal point of my research ever since. Anxiety and food — what’s the connection? Anxiety disorders are complex and although various factors play a role, chemical imbalances within the brain cannot be ignored. It’s been found within a number of studies that a diet high in sugar and processed foods actually damages the brain, worsening symptoms of both depression and anxiety. While focusing on mood, the neurotransmitter serotonin influences symptoms of poor mood and restlessness, as well as dopamine and GABA. Of course, serotonin imbalances are prominent in the brain, however, 95 percent of your body’s serotonin is produced within your gut. Meaning, poor nutrition not only affects digestion, but also mental health. Unlike nutrient-rich whole foods, which offer a range of vitamins, minerals, fiber and probiotics, the following foods may actually contribute to feelings of anxiety. It’s no secret that the standard Western diet is packed with sugar — in fact, it’s estimated that Americans eat an average of 22 teaspoons per day. Too much glucose in the blood is actually toxic and is a driving force behind a range of health conditions, including diabetes, fatty liver disease, cancer and yep — poor mental health. Within one study, published in Life Sciences, a diet high in sugar was shown to increase symptoms of anxiety. Others have shown that a high-sugar diet directly influences dopamine, decreasing the activity of D2 receptors. With the being said, the large majority of research has focused on sugar withdrawal and its effect on anxiety-like behavior. When rats were withdrawing from a liquid high-sugar diet, for instance, increased anxiety levels followed when placed in a maze. Within the amygdala of their brains, CRH also increased — a hormone and neurotransmitter that is related to stress responses. This has led to not only further anxiety research, but has provided key clues regarding food addiction as well. Fried, fatty foods and trans fats have been linked to a range of health issues, including rising cases of heart disease and colon cancer. Not only are foods fried in hydrogenated oil, but these trans fats are also found in baked goods, margarine and many other processed foods. Researchers suggest that a diet high in hydrogenated oils may lead to neuromotor and neuropsychiatric diseases. Within one study, published in the International Journal of Food Sciences and Nutrition, it was found that rats who were fed trans fats for a prolonged period of time exhibited increased feelings of fear and anxiety. In comparison to rats fed a standard diet, those who consumed hydrogenated vegetable fat displayed a reduction in exploratory and locomotor activities. Although you may first consider coffee, which actually offers a range of key health benefits, caffeine is a stimulant and when consumed in high enough doses, you may increase stress-related symptoms of anxiety. In terms of their overall effect on your health, beverages such as soda and energy drinks are highly damaging. Not only do they expose you to high levels of sugar, but when consuming too much caffeine, you can increase cortisol levels while influencing neurotransmitter balance. Within one study, published in Depression and Anxiety, energy drink consumption was significantly correlated with increased anxiety in young male adults. A clear connection has been made between deli meats, hot dogs and worsening health. The majority of research has focused on cancer, since processed meat is considered to be a potent multiorgan carcinogen. Packed with sodium, preservatives and nitrates, these questionable meats have been linked to an increased risk of depression and anxiety — they may also trigger headaches in some individuals. Companies have marketed their products as “fat-free” so that consumers believe that they’re making healthier choices. Just like carbs, fat has falsely gotten a bad rep. Remember, it’s the type of fat that you need to be concerned about. Although society has become obsessed with a low-fat diet, rates of obesity, diabetes and mental health issues continue to soar. Considering approximately 60 percent of your brain is made up of fat, you need to consume healthy sources within your diet, including the omega-3 fatty acids known as EPA and DHA. A lack of beneficial fats has been shown to cause mood impairment, while an increase in unhealthy fats leads to inflammation of the brain. The next time you pick up a fat-free option, look at the ingredients and in particular, focus on its sugar content. Although sugar has been linked to a variety of diseases time and time again, foods that contain artificial sweeteners are just as damaging — if not worse. Containing phenylalanine, a known neurotoxin, artificial sweeteners have been shown to deplete serotonin levels, triggering symptoms of anxiety, mood swings, paranoia and panic attacks. Diet soda is a classic example, as consumers often think it’s a healthier choice because these options contain zero sugar, fat or calories. Studies have shown that an increased consumption of diet soda, which contains aspartame, leads to issues with emotional ability, particularly mood swings and anxiety. There’s nothing wrong with a glass of red wine with dinner every once in awhile, in fact, it’s been shown to support positive heart health due to its resveratrol content. With that being said, regular drinkers often experience lower levels of serotonin, leading to symptoms of anxiety. In order to alleviate their symptoms, they often drink more, leading to a rather vicious cycle. Although alcohol influences key neurotransmitters, the withdrawal of alcohol can be more problematic. Alcohol-induced anxiety can last for hours after drinking, increasing one’s risk of dependence. At the end of the day, the worst possible thing you can do about your symptoms of anxiety would be to do nothing at all. By eliminating the foods above, you will instantly boost your health, both physical and mental. In addition to a more nutritious diet, focus on beneficial herbs, try yoga, meditation or Reiki, keep a journal, exercise and get enough sleep. You no longer have to live with anxiety. Take action — starting with your grocery list. Categories: anxiety, diet | Tags: alcohol, anxiety, artificial sweeteners, caffeine, diet, fat free, fried foods, hydrogenated oils, panic attacks, red meat, sugar | Permalink. Is Your Diet Making You Aggressive? Studies have shown that consumption of trans fats interrupts fat metabolism in the brain, leading to aggressive behaviors. To be specific, trans fats interfere with omega-3 fatty acid metabolism. Since the standard American diet already lacks in omega-3s (in favor of omega-6s), this throws the body way out of whack, which manifests as anger and anxiety. Additionally, trans fats cause inflammation in the body, which isn’t going to do anything to improve your mood. Ditch the Crisco and opt for whole foods instead. Liquid stimulation! Coffee is one of the most stimulating foods you can put into your body, which can be both beneficial and detrimental. When you drink too much coffee (an amount which is different for everyone since we all tolerate coffee differently), it can induce an increase in heart rate, blood pressure and stress levels. This is because caffeine blocks calming adenosine receptors, which allows other, more active and energetic neurotransmitters to take hold and flood you with energy. Unfortunately, because of this, too much coffee can turn small annoyances into high agitation and crankiness. That being said, too little coffee when you’re addicted can lead to withdrawal crankiness as well. Try to nix your addiction to coffee and enjoy caffeine as a treat every other day to keep your moods more stabilized. We all know that dieting can make you more cranky and aggressive than usual. Ridding yourself of an addiction to certain foods can be a good thing, but if you aren’t giving your body the nutrients it needs, you’re not going to feel great. Consuming too few carbohydrates, as is common in some Paleo dieters, may cause your mood to steadily deteriorate. Some of us, especially some women, may not thrive on ultra low-carb diets. Pay attention to your energy levels. If you’re low-carb and you feel sluggish, cranky and tired all the time, you probably aren’t eating enough carbohydrates. Your bad mood is your body just trying to tell you what it needs. Have you ever eaten a giant cookie and felt absolutely horrible afterwards? Have you, as is natural when you are feeling horrible, become steadily crankier with those around you? Yeah, that’s because you’ve consumed way too much sugar. This is especially apparent in children. Ever notice the post-sugar crash tantrum? Spikes in insulin levels directly affect our moods. Regulating your blood sugar by avoiding excess sugar and eating foods rich in protein, fat and fiber can help to regulate aggressive moods. For some people, an unfortunate side effect of artificial sweeteners is anger and aggression. While the mechanism that causes this isn’t exactly clear, agitation is clearly associated with artificial sweetener consumption in some. If you’re going to eat something sweet, opt for natural sweeteners, like honey or maple syrup, instead of filling your body with artificial replacements. While the aforementioned foods can be anger-inducing, certain foods can have a calming effect on your outlook and behavior. Mango and lemon both contain a compound called linalool, which promotes lower levels of stress and anxiety when inhaled. Many teas are also extremely calming, especially those lacking caffeine, like chamomile. And, of course we cannot forget—drumroll—dark chocolate. One bite of good chocolate makes you realize that the universe isn’t so bad after all. Overall, keeping a consistently healthy, wholesome, moderate diet will help to keep your moods balanced. Pay attention to what you eat. If you feel consistently off when you eat a certain food, try not eating it for a while. Your diet should make you feel good, not grumpy. Categories: diet | Tags: anger, artificial sweeteners, behavior, coffee, diet, fat, sugar | Permalink. Sure, the idea of getting your sugar fix without the calories always seems enticing, but new research suggests that Splenda—an artificial sweetener recently considered safe—may contribute to serious health problems like cancer. But even if you discount this new mouse study, you’ll still find plenty of reasons to skip out on sucralose. A growing body of research shows that artificial sweeteners may actually cause weight gain, not weight loss. One study found drinking diet soda was linked to increased belly fat; in another, each daily can was associated with a 41% jump in obesity risk. Sucralose has even been shown to mess with your blood sugar and insulin levels, causing spikes and dips that could lead to cravings later on. The bottom line: the scientists at the CSPI firmly believe you should steer clear of sucralose. But that doesn’t mean you should start shoveling spoonfuls of regular table sugar, either. Categories: artificial sweeteners, splenda | Tags: artificial sweeteners, leukemia, splenda | Permalink. Artificial sweeteners may set the stage for diabetes in some people by hampering how their bodies handle sugar, scientists say. In Wednesday’s issue of the journal Nature, researchers report that artificial sweeteners increase the blood sugar levels in both mice and humans by interfering with microbes in the gut. Increased blood sugar levels are an early indicator of Type 2 diabetes and metabolic disease. The study included a series of experiments. Mice whose drinking water was supplemented with artificial sweetener developed glucose intolerance compared with mice drinking water alone, or water with just sugar in it. The effect occurred both in mice fed normal chow and those on a high-fat diet. When antibiotics were used to kill off gut bacteria, the artificial sweetener effect on glucose intolerance in mice fed either diet was restored to normal. Taken together, the data indicate that artificial sweeteners “may contribute to, rather than alleviate, obesity-related metabolic conditions, by altering the composition and function of bacterial populations in the gut,” Cathryn Nagler and Taylor Feehley of the pathology department at the University of Chicago said in a journal commentary. In the human part of the research, gut bacteria were analyzed from 381 non-diabetics averaging age 43 who were participating in an ongoing nutrition study. They found differences in the gut bacteria among those who consumed artificial sweeteners compared with those who did not. 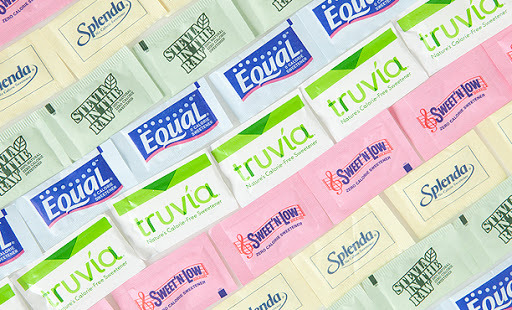 Artificial sweetener consumers showed “markers” for diabetes, such as raised blood sugar levels and glucose intolerance. In the final portion of the study, seven human volunteers who didn’t normally consume artificial sweeteners added it to their diets for seven days. After four days, blood glucose levels rose and the makeup of their gut bacteria changed in half of the participants, just as in the mice experiment. To confirm the findings, the researchers also transferred feces from people who consume artificial sweeteners into mice that were bred to have sterile intestines and never consumed it before. The mice who had saccharin became glucose intolerant, which suggests that the artificial sweetener caused the unhealthy effect. It could be that artificial sweeteners lead to an expansion of bacterial species that extract energy from food that often gets stored as fat, contributing to obesity, Nagler said. It’s also possible the sweeteners could suppress the growth of other bacteria that seem to stave off insulin resistance, she said. The commentators suggested studies to identify specific bacterial populations that promote resistance to weight gain or improve glucose tolerance could be useful as treatments. Other experts who were not involved in the research called the findings intriguing, but noted that the human findings in particular were very preliminary in terms of considering changes to nutrition recommendations. “This research raises caution that [non-caloric artificial sweeteners] may not represent the ‘innocent magic bullet’ they were intended to be to help with the obesity and diabetes epidemics, but it does not yet provide sufficient evidence to alter public health and clinical practice,” said Nita Forouhi, program leader at the Medical Research Council’s epidemiology unit at Cambridge University. Categories: artificial sweeteners | Tags: artificial sweeteners, obesity, weight-loss | Permalink.